Suffers His First Electoral Defeat. David Maraniss. First in His Class: A Biography of Bill Clinton. New York: Simon & Schuster, 1995. [An excellent, albeit adulatory, account of Clinton's life before his election as President of the United States. 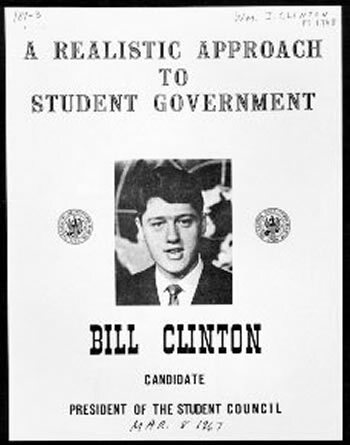 This is the only history / biography so far to look closely at the student years of Bill Clinton. if one is to understand what really happened. by G.U. 's then Jesuit Administrators to put an end to the four autonomous undergraduate professional schools. he served as the chairman of a so-called "unification committee." "Was there really an East Campus / Main Campus rift back then? Did you ever try to unify it?" "Yeah, I got vetoed when I tried to do it [unify the campus]. I was sort of the leader of the East Campus deal. that they were sort of "the real Georgetown." Well, there was something to that. and then the others were founded some time after that. and the School of Foreign Service were all in the Law School. we all had our classes up there. except for the non-Catholics taking alternatives to theology." do you sense that that rift has changed at all?" "The school seems more integrated. with a lot of different schools that are part of a whole. I think having the School of Foreign Service physically up there on the campus makes a big difference." An Interview with Arkansas Governor Bill Clinton"
Georgetown's Blue & Gray, Vol. 2, Issue 1, 1988, pp. 24-25]. and has been located on, or next to, the Georgetown campus ever since 1932.
and in stating that he was a leader of those trying to "unify" the schools. was, in great part, caused bystudent resistance to his unification efforts.